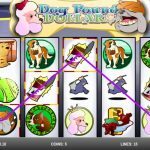 Dog Pound is a slots game developed by Rival. It is a veteran in its category and it really shows. The graphics feel a bit dated and the plot well…. there is none. It doesn’t mean that you won’t enjoy it. You probably will! With a very nice payout rate it is sometimes all that matters. The wild symbol is the Bulldog. It will replace any other symbol to complete a winning combination and with a multiplier of 2x for everything you win. The Chihuahua is the scatter symbol. When you get 4 or more you trigger the free spins feature getting 15 free spins. But even with 2 Chihuahuas you get 2x of your bet and with 3, 4, and 5 Chihuahuas you get 5x, 20x and 500x of the bet placed. 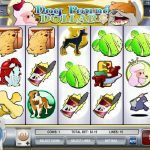 I’m going to be upfront about it ; Dog Pound is not one of my favorite but… it is still fun and handing a good payout rate. The thing is you can just find better games in every aspect. Really like digging for money? 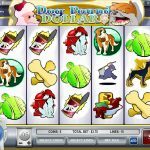 Try playing Diggin Deep a 5 reel slot by Rival.